Ah, a good night’s sleep. We all know how important it is, yet for many of us, it’s elusive, challenging, and frustrating. Poor sleep is a sign of imbalance in the body and, if left untreated, it can lead to chronic insomnia and health problems. But what exactly is insomnia? It can be described as difficulty or inability to fall asleep, waking throughout the night, restless sleep, waking in the early hours of the morning with an inability to fall back asleep, and dream-disturbed sleep. Regularly disturbed sleep affects every aspect of your life. Physically, you may suffer from a lack of energy, lowered immune function, and impaired motor skills. Mentally, poor sleep can lead to anxiety, depression, and poor cognitive function. Traditional Chinese Medicine (TCM) believes that insomnia is a symptom and not a disease. Insomnia is broken down into “true insomnia” and “transitory insomnia”, according to TCM. True insomnia is caused by prolonged periods of emotional upset and stress, poor diet, and health issues from an extended illness. Transitory insomnia is a result of things such as weather changes, outside noise, stimulants, eating too late at night, and recent emotional upset. Liver Imbalance: Insomnia caused by anger, frustration, and emotional turmoil is often associated with a liver imbalance. People with this imbalance often wake up between 1:00-3:00 am and have difficulty falling back asleep. Acupuncture treatments that balance the liver can help relieve these emotions and promote a restful night’s sleep. Stomach Imbalance: Insomnia caused by improper diet, eating late at night, and food intolerances can cause stagnation in the stomach and result in poor sleep. 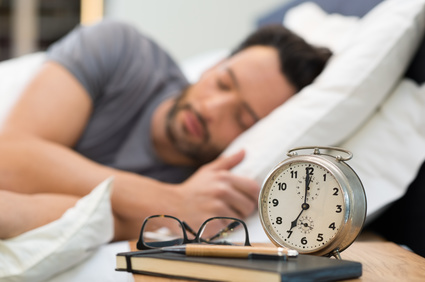 Acupuncture, along with changes in the diet, can resolve these sleep issues. Hormone Fluctuations: For women over 45, this is the most common cause of insomnia and it is typically the result of a kidney imbalance. Acupuncture replenishes the kidney yin to restore hormone balance and help patients get a good night’s sleep. Tossing and turning at night and losing valuable sleep doesn’t have to be the norm in your life. There is never a “one treatment fits all” approach for insomnia since there are different causes for different people. Contact Brad Hill Wellness at 301-639-9759 to schedule your individualized consultation. This entry was posted in Acupuncture, Sleep, Treatments. Bookmark the permalink.